It emerges from external surfaces and inferior boundaries of the lower eight ribs that consists of the area between rib five to rib twelve, on an anteriorly rounded oblique line running downward as well as backwards on the side of the rib cage. Its insertion is within the lateral side of the anterior abdominal aponeurosis, which has its own wide, aponeurotic tendon of attachment and anterior half to two-thirds of the outer border of the apex of the ilium. In the middle of the xiphoid process as well as symphysis pubis, this tendon finally inserts into the linea alba, where it connects with the aponeurosis of the external oblique of the other side. The lowest fibers of the external oblique enter instantly inside the pelvis and the remaining muscles enter within its aponeurosis. The external oblique consists of a large, thin, muscular sheet on the side of the trunk and its large aponeurosis on the front of the abdomen. The forms of the external oblique bundles are located in the lowered intercostal spaces among the ribs. The distinction among the external oblique bundles and the ribs, whose specific forms appear to be about the same size, is that the external oblique bundles arc straight and almost parallel since they spread out vaguely through their line of origin, whereas the ribs turn forward at their costal cartilages. The muscular part is divided into an upper thoracic portion and a lower flank portion. The thoracic part closely sticks to the shape of the rib cage. The individual ribs may be noticed beneath it when the muscle is relaxed particularly when the rib cage is enlarged at the time of inhalation. The thoracic portion becomes visible when tensed, dividing within elongated, oblique belt like bundles or digitations are located on the overall rounded form of the rib cage, whose figures cover the individual ribs. The flank part, taller in front and shorter in back which resembles a part of a cylinder as it curves around the side of the trunk. 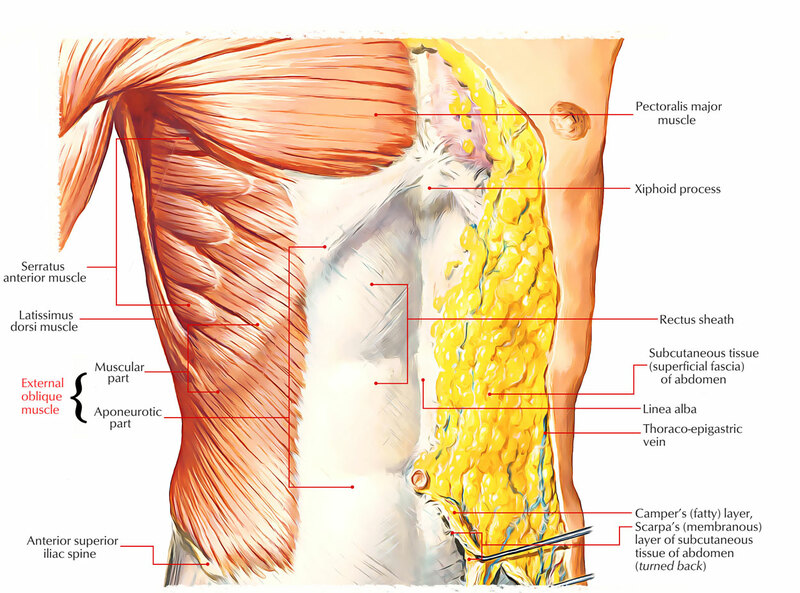 The flank pad is smooth – the fat pad blends into the form and its muscle fibers are usually not seen, however, the bundles of the thoracic part are usually detected whenever the whole muscle is tensed. In the frontal view of the body, the side profile of the flank pad is generally a little bit convex; however it may be straight or have a subtle double convex curve. The external oblique muscle is supplied by ventral divisions of the lower six thoracoabdominal nerves and the subcostal nerve on each part. The cranial portion of the muscle is circulated by the lower intercostal arteries. The caudal portion is circulated by a section of either the deep circumflex iliac artery or the iliolumbar artery. These muscles help pull the chest, as a whole, downwards, which compresses the abdominal cavity. The external oblique muscle also helps in the rotation of the spine even though relatively lesser in extent. The external obliques on either side not only help rotate the trunk, but they carry out a few other vital functions. Since the muscle contributes to a variety of trunk movements, strain or injury to the muscle can be incapacitating. Movements that do not directly use the muscle, like ambulant motions like walking or running which cause slight actions in the torso can also be included. An oblique strain is usually characterized initially by sudden, acute pain within or around the rib cage. The area is commonly tender to touch, and a bruise may develop, depending on the severity of the injury. Twisting and bending motions are typically painful. The oblique muscles are much more active while being seated up compared to while reclining. As a result, so much as sitting or standing may hurt following an oblique strain. Deep breathing, sneezing or coughing also commonly causes pain.